It’s been an interesting year. Although I started and stopped attempting to run in previous years, I consider 2013 to actually be my first year of running. I started on January 25, 2013. 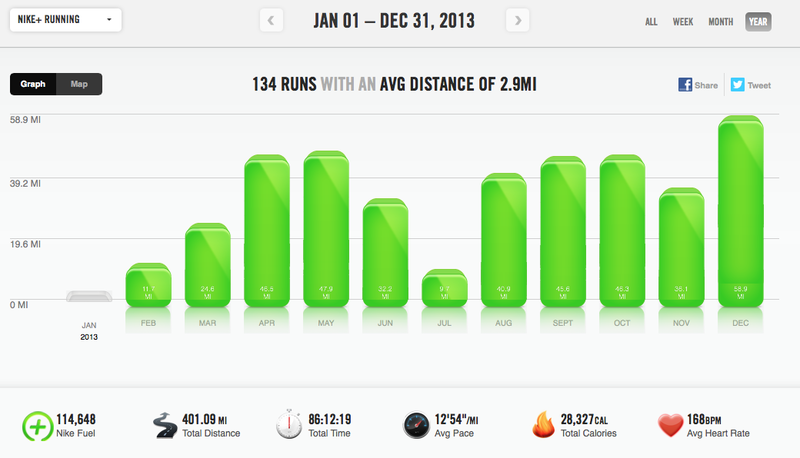 Disclaimer: I didn’t start using Nike+ till mid-February, so some runs are not represented. Also, Nike+ has a tendency to record a longer distance than Garmin, so totals may not be in agreement with those below. I started off pretty slow. With my previous failed attempts at Couch to 5k, I wasn’t willing to just jump back into it. So I hopped on a treadmill in my old ratty Adidas sneakers and took off at my own pace. My first couple runs were a little over 2 miles each, averaging over 14 min miles. I tried running out on the pavement for some shorter runs, which I was able to do faster. Mostly, I was just trying to keep my runs around 30 minutes 3-4 times a week. This month was pretty similar to January, except I started throwing some 5k distance runs in the mix. I bought my first pair of real running shoes! By the end of the month, I could finish 3.1 miles in around 42 minutes. I kept my distance about the same in March, but worked on speed, doing things like hill repeats. Around the middle of the month, I achieved a best mile time of 12:39. The Color Run rounded out the end of the month. April is when I started to get serious. I had a 5k coming up in May that I wanted to do well in, so it was time for some mileage increases! I started back on week 3 of Couch to 5k. I doubled the distance I ran in March. I managed a best one mile effort of 10:26, and a best 5k effort of 39:48. I was running sometimes three or four days in a row, and I even attempted one six miler. Oh yeah, and I started this blog! I started off the month doing 6.4 miles worth of intervals around Boise, Idaho. On May 12, I bettered my 5k time even further by running 3.1 miles in 36:40. By the time of the Law Enforcement Memorial 5k on May 17, I felt pretty ready. I ended up running it in just over half an hour, which I was elated with. The course was slightly short, but I still count it as my best 5k race time. I also achieved a best mile time of 10:06 during the race. But all was not well. I had slightly hurt my left ankle early in the month, but pushed through it. Now my right calf was starting to ache. On the 27th, I went out on the greenway and ended up limping back to my car. The month I “graduated” from Couch to 5k! I did a few easy runs early in the month to not anger my calf muscle, but this month was mostly spent preparing for a 10k in early July. My mock 10k that I ran midway through the month put me at a time of 1:17:44. I felt okay until a couple days later when my left hip starting hurting, and I couldn’t even get through a mile run. I took a week off and saw the doctor, who confirmed that I wasn’t broken and to take it easy until after the 10k, when I should take a month off. I stiffly and gingerly made it through the rest of the month. I only ran twice in the month of July. A quick 5k run on the 2nd and then the Music City Fourth of July 10k on the 4th. Despite my injuries, I exceeded my expectations for the race. I officially finished in 1:14:37 and even got best 5k (34:22) and 1 mile (9:44) times. The next few days were spent in agony, though it was worth it. I started back doing intervals, averaging around 12-13 min miles. By the middle of the month, I ran my first complete mile since getting injured. But the best month of my running career so far? Probably September. I started off the month with a marathon relay, in which I, again, bested my mile time with an 8:48 mile (that still stands today). Just a few days later, I managed to run 3.1 miles without walking (a first!) and less than a week after that, I achieved my best 5k time of 33:28! I ran a 5k while on vacation in Seattle and also started half marathon training. Out of all my runs that month, only a couple averaged over a 12 minute mile. I really felt like I was getting better and faster! As I continued with half marathon training, it soon became apparent to me that I was getting burnt out. The long runs were zapping my energy for my weekday runs and my weekday runs were wearing me out for my long runs. My times began to become slower and slower. I did manage an awesome 5k at the Go Commando 5k in mid-October, where I did the whole thing without walking (my goal). The days were getting colder and shorter. Colder days meant my asthma was acting up more. Shorter days meant more time on the treadmill and less on the pavement. After an 8 mile run on the 9th, I couldn’t walk. Something had happened to my left ankle. Yes, another injury! I took two weeks off to nurse it back to health, but ended up walking The Mo Run, which made my right hip start hurting due to the limping I had to do. The month started with some 15+ min/mile treadmill runs. So slow. The goal for the month? Just push through the long runs, run/walking at whatever intervals I can to get through the distance so I could still do the half marathon in January. I did my first trail run, which was really a glorified hike. By the end of the month, I was running a 5k in 40 minutes, about where I was at in March.